Dove Cameron made her way to the red carpet for the 75th Golden Globe Awards at The Beverly Hilton in Beverly Hills, CA this evening(January 7th). 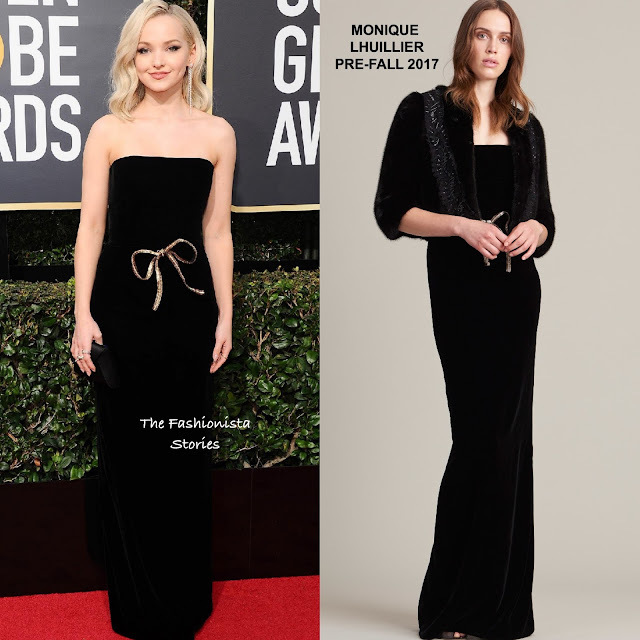 Working a minimalistic look, she wore a MONIQUE LHUILLIER PRE-FALL 2017 black strapless velvet column gown which featured a contrasting gold embellished bow belt. I love how simple but elegant she looks. On the beauty end, she went with side parted, light waves & smokey eyes which topped off her look along with a black clutch.